Rediff.com » News » Is Priyanka more than a show-stopper? Can compassion, common courtesy or an 'emotional connect' win seats in the harsh realpolitik of UP, a state riddled with divisions of caste and religion, and confronted with a seemingly impregnable BSP-SP alliance? asks Sunil Sethi. 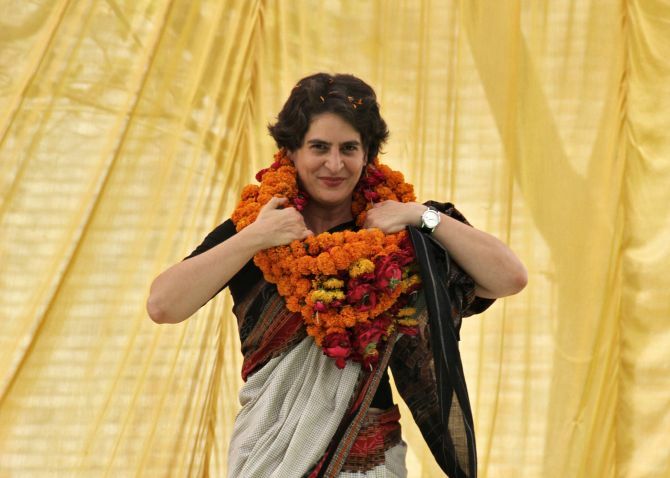 Priyanka Gandhi Vadra's empowerment as the key party functionary in eastern Uttar Pradesh for the upcoming election campaign is the sort of news break that suddenly has the political dovecotes aflutter. The question of will-she-won't-she has hung so long in the air that now she's taken the plunge intriguing speculations arise. Could Priyanka be the Congress party's trump or Get Out of Jail card in a crucial state that returns the largest number of MPs -- and where its stock fell from 21 in 2009 to an abysmal two out of 80 seats in 2014? Is she a mere show-stopper or a potential vote-snatcher? Does the five generation-old Congress dynasty now establish it as a truly monarchical enterprise? And can the Gandhi siblings -- under the protective benediction of a Queen Mother -- build on an anti-incumbency wave against Narendra Damodardas Modi, clearly visible in Madhya Pradesh, Rajasthan and Chhattisgarh? Phrases such as 'show-stopper' or 'good optics' oddly originate in the fashion trade when designers attempt to lift jaded shows by pulling out a friendly film star on catwalks to rack up media footage. There is no evidence, however, that such moves translate into retail sales with customers queuing up. Today those words echo what Indira Gandhi, claiming to be a reluctant entrant, used to say before her active rise in politics in the 1960s. Styling herself in the manner of her grandmother -- simple cotton saris, radiant smiles, reaching out to crowds -- she proved an undeniable crowd-puller while campaigning vigorously in the family pocket boroughs of Amethi and Rae Bareli in 2014. Then she quietly dropped out of public view though it's widely known that she is one of Congress President Rahul Gandhi's closest political counsellors. Certainly she has greater visual appeal than Mayawati, Akhilesh Yadav (and definitely Smriti Irani). On private occasions, such as shopping locally or attending a family friend's funeral she is restrained and unpretentious, keen to avoid any undue attention. It's worth recalling that in 2008 she went to Vellore jail to meet Nalini Sriharan, one of the conspirators in her father's assassination. 'I do not believe in anger, hatred or violence,' she said later, emphasising that her mother had intervened to commute Nalini's death sentence to life imprisonment. It's what you might expect from a practicing Buddhist with degrees in psychology and Buddhist studies. But can compassion, common courtesy or an 'emotional connect' win seats in the harsh realpolitik of Uttar Pradesh, a state riddled with divisions of caste and religion, and confronted with a seemingly impregnable BSP-SP alliance? "When you're down to a near cipher tally of two seats and a vanished party base anything Priyanka brings home will be a bonus," says a former Congress MP from the state. Strategically, her appointment to manage UP's eastern flank is aimed at Narendra Damodardas Modi minding his shop more closely in Varanasi and, equally, tie down Ajay Singh Bisht to his home turf, having disastrously lost the Gorakhpur by-election last March. "Rahul Gandhi has dropped the idea of alliances in favour of going it alone. His testing ground is to revive the Congress base," says a shrewd Shiromani Akali Dal Rajya Sabha MP with an old acquaintance with the Gandhi family. The Gandhi siblings are royalty, not merely dynastic legatees. The country's landscape of leadership, from Kashmir to Kanyakumari, simply teems with scions of political dynasties. An abbreviated list would include Omar Abdullah, M K Stalin, Akhilesh Yadav, Jayant Chaudhury, Tejashwi Yadav, Naveen Patnaik, Supriya Sule, H D Kumaraswamy, K T Rama Rao and Chandrababu Naidu's only son Nara Lokesh who currently holds triple cabinet portfolios of information technology, panchayati raj and rural development. Many BJP heirs are raring to go, at the slightest hint of a heads up. Priyanka Gandhi Vadra is to the manner born among a glittering group that in New Delhi's elite circles is known as Rahul Gandhi's 'chamber of princes'. If she appears pleasant, and instinctively knowing, it's because she's grown up among courtiers in the oldest court in town. As for her husband Robert Vadra's embarrassing and swiftly acquired millions that an India Today cover memorably titled 'The Unreal Estate of Robert Vadra', it's a fly in the ointment to be stoically borne. Is it a bigger or lesser issue than the numerous cases of disproportionate assets several party leaders and their progeny stand accused of amassing? Political corruption, dynastic succession or pre-election giveaways such as farm loan waivers and reservation quotas are old tropes voters are familiar with. What they want are jobs, agricultural reform, policies that work, not unimplemented schemes. What they appreciate in leaders is the promise of humility and common touch that Priyanka has over Narendra Damodardas Modi's arrogance and swagger. That's why she may be more than a mere show-stopper.